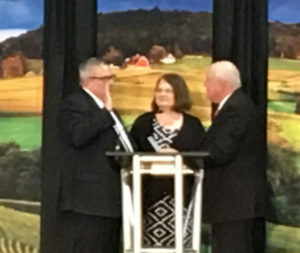 Northey takes the oath from Perdue. A day after resigning as Iowa’s Secretary of Agriculture, Bill Northey took the oath of office for a federal job. Northey is now an Undersecretary in the U.S. Department of Agriculture. 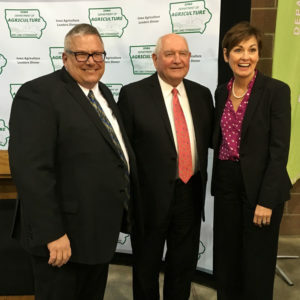 U.S. Agriculture Secretary Sonny Perdue flew to Iowa to conduct the ceremony tonight at a previously scheduled ag leadership banquet on the state fairgrounds. After the event, Perdue told reporters Northey will be in charge of organizing and consolidating some agencies within the U.S.D.A. — that includes the Farm Service Agency, the Natural Resources Conservation Service and the Risk Management Agency. Northey delivered a 15-minute speech at the banquet. He started with a thank you to Iowans who supported him and near the end Northey thanked his sister and her husband for taking over his farming operation near Spirit Lake. 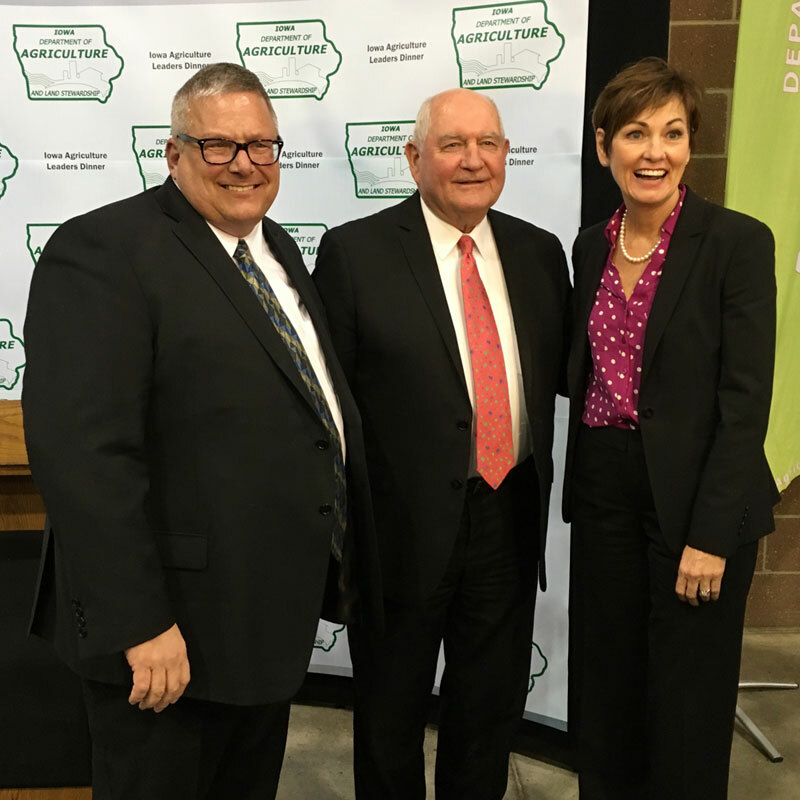 Bill Northey, Sonny Perdue and Kim Reynolds. In early September, President Trump nominated Northey to be Undersecretary for Farm and Foreign Agricultural Services. A committee in the U.S. Senate endorsed his nomination in October, but Texas Senator Ted Cruz held up a senate vote on Northey as leverage for changes in the federal ethanol production mandate. Perdue told the crowd Northey had “finally been liberated from the U.S. Senate” last week. “In case you have any questions about it, Bill Northey, Sonny Perdue and Donald J. Trump stand for the (Renewable Fuels Standard), unequivocally,” Perdue said and the crowd gave that statement a standing ovation. Perdue called Northey an “evangelist” about what’s working in Iowa agriculture and someone who has the “moxie to get things done” in the U.S.D.A. “I frankly have been congratulated so much tonight over Bill Northey, I feel like I’m getting married,” Perdue quipped and the crowd laughed. This was Perdue’s fourth visit to Iowa since he was sworn in as U.S. ag secretary last April. It’s his first since President Trump announced tariffs on steel imports and tweeted about winning a trade war. During a question-and-answer session with reporters, Perdue was asked how Iowa farmers who may be “spooked” by those developments should react. Perdue told reporters he and others are working “feverishly” with the president on trade issues. Perdue suggested Trump’s unconventional comments may have positioned the U.S. for a breakthrough in the renegotiation of the North American Free Trade Agreement.